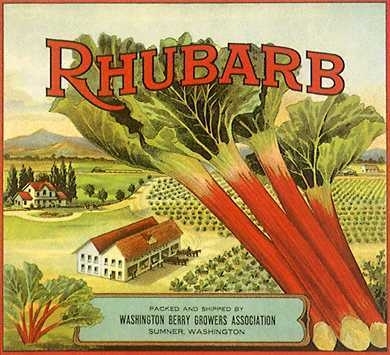 Rhubarb like many plants now used for food was originally used as a medicinal plant in Asia. This vegetable has really only been used as a food since the late 18th century. Over the centuries many opinions about what part of Rhubarb is safe to eat or use have been bandied about. Even as late as the 1940's there are reports of leaves being cooked as vegetables. There are also many accounts of illness and even death related to Rhubarb leaves. Today we know that the leaves are poisonous and should be discarded after the stalks of Rhubarb are pulled from the ground. Growing Rhubarb is super easy. Our Rhubarb is the old reliable, Victoria Rhubarb. In most areas full sun is preferred. In hot summer areas, it can be successfully grown with morning sun and late afternoon shade. We have even had success growing it with more shade than sun. But, it does get very hot here with many days over 100 degrees. Rhubarb should be planted in a spot where it will not be disturbed for many years. While some gardeners prefer to uproot it and divide it every five years or so, we have grown it undisturbed for over ten years. It seems totally unnecessary to uproot it and divide the crown. Rhubarb does need a big space though. The leaves are elephant ear size and each plant should be given at least three square feet or more. Harvest stems in summer when the beautiful red color shows up. The color may or may not take over the whole stem. This may have to do with the amount of shade the plant receives. Stems should be snapped off at ground level. A bit of twist might help with this. only take about a third of the plant's stems each year. Even though Rhubarb stalks have "strings" like celery, it is not necessary to remove these. They cook away. To use the stalk, remove the leaves and safely discard. Wash the stems well and cut off the very end that was attached to the ground. Chop the Rhubarb according to your recipe and cook with strawberries and sugar or other sweeteners. Nothing is quite as good as Rhubarb pie.